Kinder Morgan launches BC consultations on controversial pipeline expansion | The Hook, A Tyee blog. 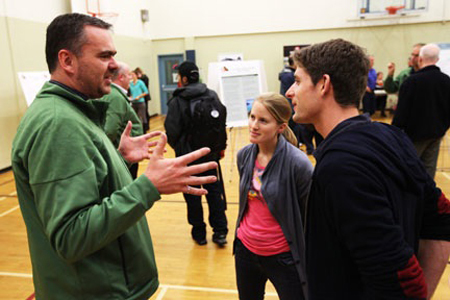 Michael Davies, Kinder Morgan's engineering director, speaks with the public at the company's North Vancouver open house on Saturday. Photo by David P. Ball. 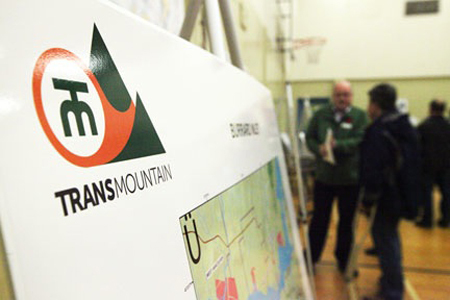 Energy giant Kinder Morgan is holding public consultations across the Lower Mainland over the next several weeks, bringing its proposed TransMountain pipeline expansion under public scrutiny. With the company's next information session today (Nov. 7) in West Vancouver, proponents and activists alike are set to share their views with company officials over its proposal to more than double the pipeline's output -- from 300,000 to 750,000 barrels a day -- including boosting Burrard Inlet oil tanker traffic through Kinder Morgan's Burnaby terminal. While environmentalists, First Nations and the mayors of Vancouver and Burnaby have expressed opposition to the project, the company insists that safety is a top priority, and criticisms are being heard. "Our pipeline's been operated safely for 60 years," Michael Davies, Kinder Morgan's engineering director, told The Tyee at an event in North Vancouver on Saturday. "We're going through environmental studies to identify what environmental impacts there might be, and we're meeting with communities along the pipeline to understand what their concerns are. "All of that informs the design... With a large project like this, it's reasonable to expect there's going to be differences in opinion and concerns about how it's done. That's a big part of what this process... is about learning what people's concerns are." Davies said that regular pipeline patrols and inspections are among the planned safety measures. At Saturday's open house, the first of at least six such events in the Lower Mainland plus dozens of sessions planned for Vancouver Island and the Interior, some attendees criticized the format, accusing the company of deliberately avoiding public embarrassment or tough questions. "The form of this open house is set up to avoid having to answer tough questions in front of a group of people," Sven Biggs with Tanker Free BC told The Tyee, as roughly 20 public visitors examined colourful displays and nibbled on free cookies. "That's why they have it three or four hours long, why there's no Q&A session, why there's no speakers. "It's just a bunch of poster boards with pretty pictures in a room, and a bunch of company officials here to spin the project in the way the company would like the public to see it. The most concerning part of this is that what this is really all about is ticking off a box on a form somewhere that says they consulted the public and (have) taken their concerns into account. Clearly, that's not what today's open house is about -- it's about white-washing this project." Some members of the public told The Tyee they were undecided about the TransMountain proposal, which the company says will likely be submitted next year. "I'd heard about this project -- there's certainly a lot of publicity about this and the Northern Gateway project," Paul Tubb, a North Vancouver retiree, told The Tyee while looking at a display outlining the pipeline's existing route from Alberta. "I like to stay informed about what's going on. "I like to keep an open mind. I haven't heard anything particularly negative, in the sense of being specific to this project, (but) there's certainly been concern about this type of project and product. I'm here to learn more about it." Retired oil and gas engineer John Hunter told The Tyee that there's "too much misinformation" from environmental groups, and that Kinder Morgan will benefit B.C. with "big bucks... in terms of jobs." In a century of tanker traffic, he added, Vancouver waters have never seen an oil spill. Other members of the public expressed suspicions around the company's safety claims, pointing to a major rupture in Burnaby in 2007 and others along the TransMountain route over the years -- which the company admitted on two poster board displays. Others raised questions around maritime accidents. "With the increased tankers in the Inner Harbour, the likelihood of increased problems seems to go with that," said retired teacher Jennifer Cooper. "The harbour's not changing in size; you're getting higher density of the freighters in that area. It's common sense that there would be problems as a result." Indigenous communities along the Burrard Inlet -- what they call the Salish Sea -- have voiced strident opposition to the project, with the leaders of Tsleil Waututh and Squamish First Nations signing a declaration earlier this year vowing to protest the project. "The Squamish First Nation are very concerned about this magnitude of industrial activity that would adversely impact our traditional territory," Squamish Chief Ian Campbell told The Tyee by phone. "Once they allow that type of development, it'll only grow. "We'll never be able to get rid of it. The impacts are not compatible with our vision for how we want to see our territories recovering from industrial impacts... We're seeing the impacts, decade after decade, of the greed and the mentality of Western management that continues to consume without any spiritual connection to the lands or the waters." Today's West Vancouver open house (4 to 7 p.m. at Kay Meek Centre, 1700 Mathers Ave), will be followed by sessions in East Vancouver (Nov. 13), Downtown Vancouver (Nov. 15), West Point Grey (Nov. 17), and other Lower Mainland cities later this month. More information here. David P. Ball is a freelance reporter based in Vancouver and regular contributor to The Tyee.